Everyone in our house loves books and reading and libraries. 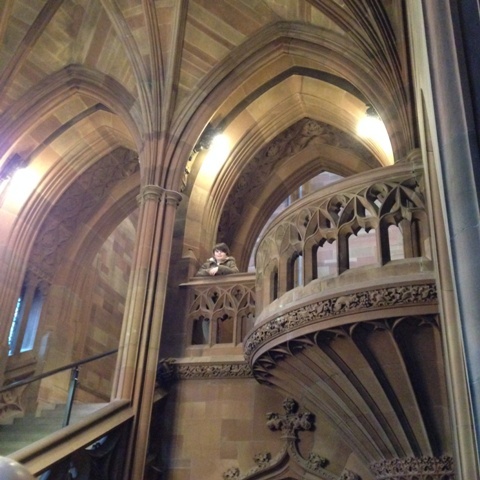 Everyone in our house also loved John Rylands Library – certainly one of the most beautiful we have ever visited. Slap bang in the middle of a highly commercialised area of Manchester, this gorgeous Victorian, neo-Gothic building looks like a fish out of water. But then it always did, when it was built they deliberately placed it next to a violent slum. Apparently the intention being to show Manchester’s “underclass” that there was an alternative. Then, as now, entrance is free. We entered through their new, ultra-modern extension by the side. The building has recently been restored at massive cost. They have done a great job. Son picked up a children’s trail sheet here, which he proceeded to follow as we made our way around the library – a great idea, it kept him occupied and interested and definitely saved the day. 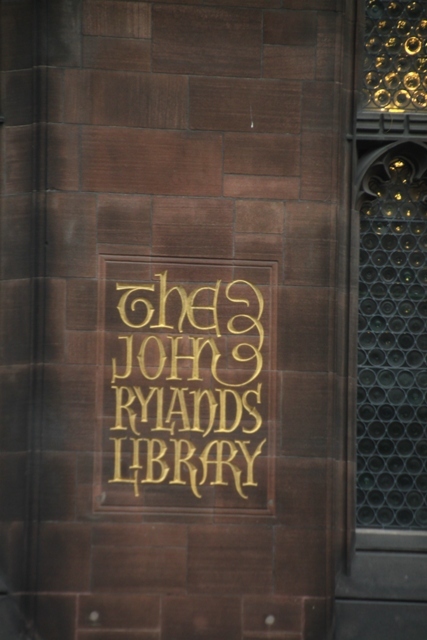 John Rylands library was the first building in Manchester to be lit by electricity. 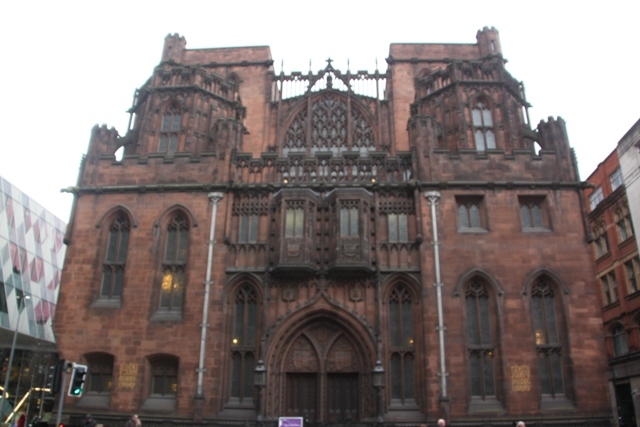 It was the idea of a lady called Enriqueta Rylands who built it in memory of her husband John. He died in 1888 and was the city’s first multi-millionaire having made his money from textiles. 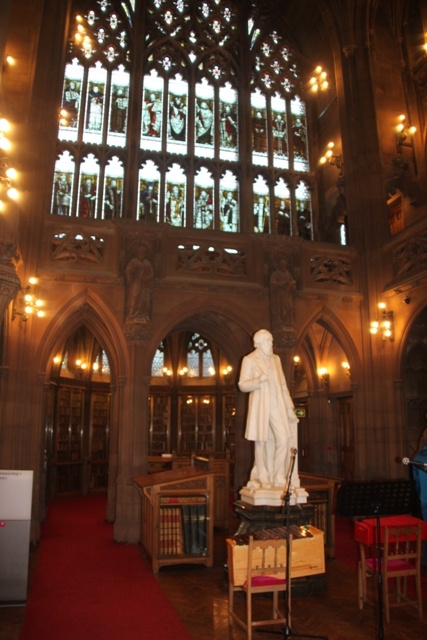 The building has been referred to as “Manchester’s Taj Mahal” – a place built out of a widow’s love for her husband. Inside it is just glorious – parquet floors, vaulted ceilings and spectacular detail, it reminded me of a grand cathedral. We just wandered. 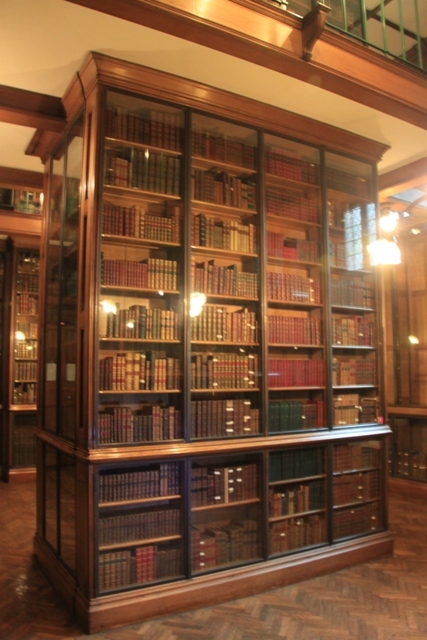 The place is stuffed with books – over 250,000 and over a million manuscripts. 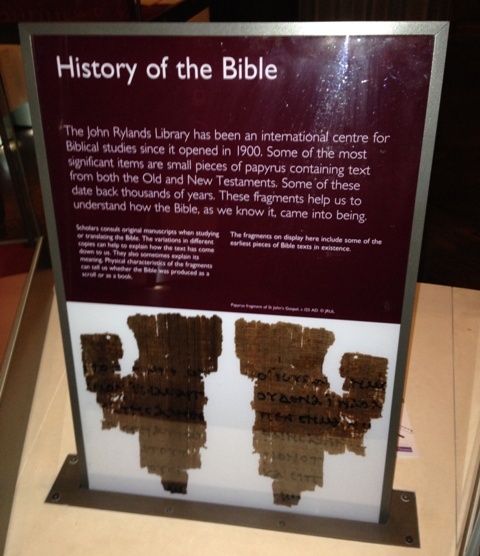 Mrs Ryland was quite the collector, she managed to obtain for her library, amongst other things medieval manuscripts, a Guthenberg Bible and the 2nd century St John fragment – the oldest existing remnant of the New Testament. Son discovered some computer terminals aimed at children with information about the museum, its treasures and history. He got stuck in and found it fascinating. Husband and I were able to browse, read and absorb – the displays are a little heavy and not so interesting for young children, however the computers saved the day for us. The library was intended to be mainly theological, but they also have original Dickens novels and a first edition Shakespeare. 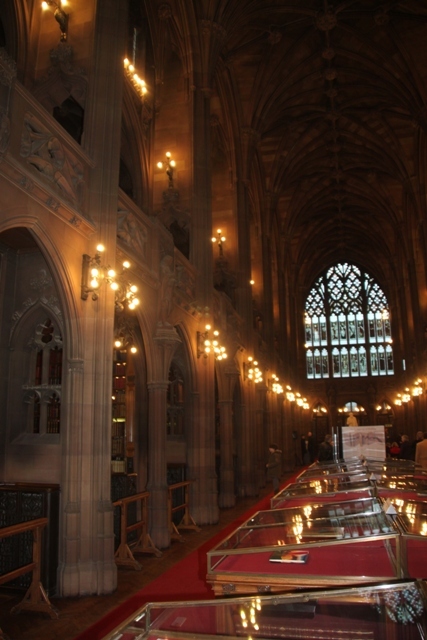 The real highlight is the main Reading Room. It has lots of white marble statues, stained glass windows, beautiful leather books and is grand and opulent. We probably only stayed about an hour, Son was ready to hit the gift shop after this time. It is though a true gem of a place, definitely worth stopping by and walking through. We were so impressed, we will be back. I would love to camp here! I know Cherrie, I didn’t want to leave it is unbelievably beautiful. 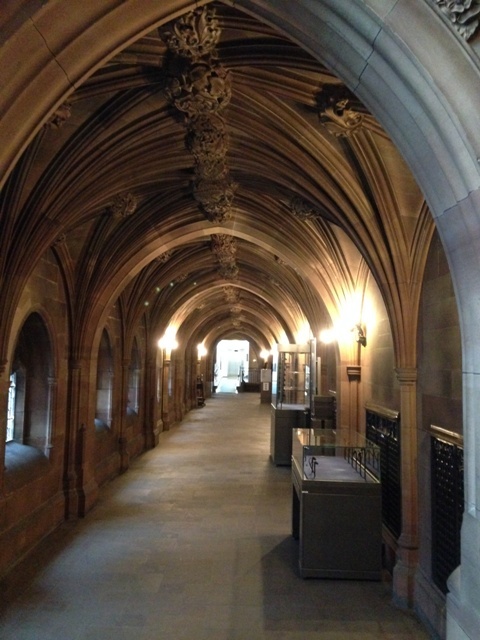 The library reminds me of something out of a Harry Potter movie, the architecture is amazing! Yes, those were my son’s exact words, it was like being in a Harry Potter movie but it was real! I wanted to say the same thing: Harry Potter 🙂 It looks like in a fantasy, it’s very pretty! I am just a little, ok very jealous. This looks like a destination I would love! 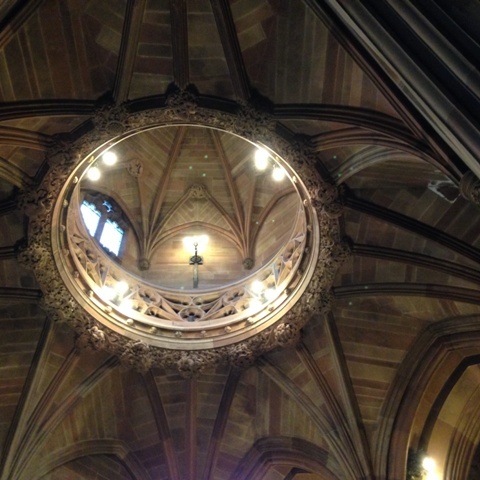 It is just wonderful, I loved it…..a beautiful building and a special atmosphere inside too. Wow, that architecture is beautiful! My sister loves books so when we travel, we’re always popping in and out of the local library. Would definitely love to add this one to my travel bucket list! I have the same library addiction when I travel, this one is especially beautiful! Yes, it is a really special place. Wow – amazing photos! Great they’re engaging the younger set with a children’s trail and the computer terminals, too. Thanks for sharing that piece of info. 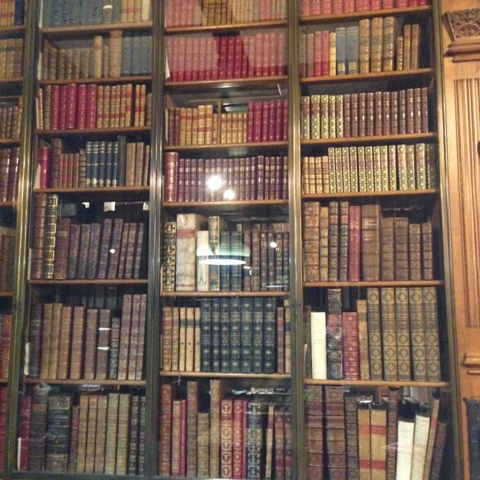 This place is amazing…..I have never seen such a beautiful library! Lovely! 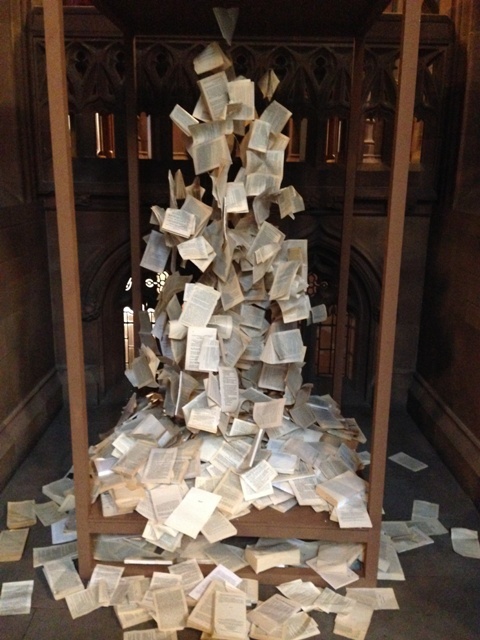 I completely agree Diana – it is so gorgeous and probably the most beautiful library I’ve seen! Definitely – one of the nicest libraries I’ve seen! 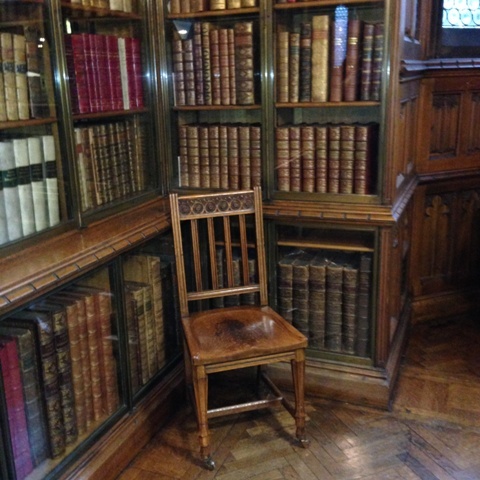 I’d like to go back to Manchester to spend more time in this beautiful library…. 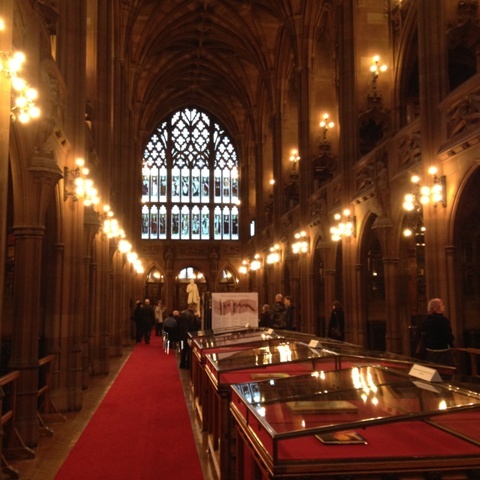 It is beautiful and fascinating history too, if you come back to Manchester you must go here! Thanks for sharing. I always love libraries. This library looks like a church. Beautiful. It is a gorgeous library, it reminded me of a church too. And the Harry Potter movie!